Theater in the Now: Review: A Comedy That Will Make You "AHHHHH!" Review: A Comedy That Will Make You "AHHHHH!" We all remember the early 90s holiday classic "Home Alone." You know, the madcap comedy about a family who forgets the youngest kid when packing the courtesy van thusly leaving him home alone. The film was the launching pad of child actor Macaulay Culkin as well as the infamous line: "Ahhhhhhh!" Comedy troop Recent Cut Backs takes the flick, condenses it into sixty minutes, and reminds the audience just why we love the movie. The parody, playing The Pit, is nostalgia to the max with multi media devices, puppetry, and foley work that brings laughs and smiles from start to finish. Kevin!!!!! is virtually a jam- packed highlight reel of "Home Alone" through non-stop comedy. There's no shortage of creativity on the stage. This is one of those shows where one mistake will cause a domino effect of chaos. It's evident that director Kristin McCarthy Parker anticipated every single detail with great thought as, even with at high-tempo, everything felt purposeful. With an intricate set up of lights, live-feed projections, and the tiniest of sets and puppets manage to find a home on stage. At first glance, it all looks like a jankity middle school science experiment but once the lights rise and the choir sing, it’s off to the races. Kevin!!!!! is a show that relies heavy on the source material. Pray you remember it all or you will certainly be left alone. With so many characters to track, it starts off in a whirlwind. And perhaps that’s the point. It goes so fast, you’ll likely miss some of the tiniest jokes that come through the projected set. 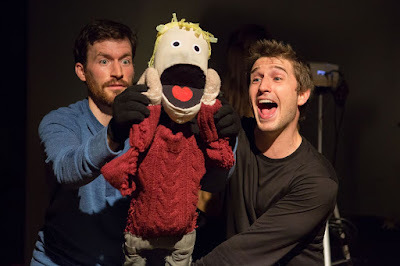 There are some slight inconsistencies between puppet, projection, and human, but they seem to be forgiven for laughs. And remaking the pranks that Kevin plays on Harry and Marv are as good as they can possibly be. There is no way to get off the rollercoaster once it starts. The four animators and the four piece Choir keep the car on track without ever crashing. Not even the slightest of wire entanglements can derail this company. Taking the central role of Kevin, Nick Abeel masters the vocals with ease. Sporting Kate McAllister’s iconic nasty-colored blazer, Natalie Rich captured the cadence and mannerisms of Catherine O’Hara’s character. It was a character to study that you have to see to believe. What you have to remember with a show like this, with as much action as there is, there needs to be something underneath. The pulse of the play came in the form of the Choir, comprised of Sarah Godwin, Evan Maltby, Richard Sears, and Michelle Vo. The quartet serves up helpings of acapella underscoring and the occasional comical sound effect.